This race is one of my favorites. I don’t know exactly why since I have never finished it. I have either flatted or broken a spoke. So it has been a bit of a love hate relationship. I love the course. I love the concept. I love this time of year. I hate not finishing races. Second lap was a bit faster with more attacks, but it was still very comfortable. The wind started to pick up and I got excited. I usually can do well in the wind and started to pay more attention to positioning in the cross wind sections. On this lap we screamed up Nelson. I was in my 53×15 up the climb, pretty much going as hard as I could. Attacks and bridging was occurring and I was suffering. I crested the climb in perfect position, but on the transition to a flatter section my left inside calf cramped. This has been happening a bit this year and I can’t figure it out. I switched to Speedplay pedals, but other than that I haven’t had any changes that warrant this cramp issue. I had been metering my water more than I should due to the fact I only had 2 bottles for nearly 80 miles of racing on a dry hot day. But I didn’t want to take it all in too quickly. I guess this was my mistake, because I had to drift to the back to let me leg de-cramp. I slammed some Gatorade and a gel, but by the time my leg came around I was about 10 seconds off the back. I began to chase in earnest and caught 2 riders. We began working pretty well together and started the 3rd lap of 4 a few seconds back. As we were just about to catch the main group (which had slowed once the break was established) I made a critical mistake. I was the last of the three after taking a pull and kinda riding on the edge of where the road fell off into the ditch. The rider in front of me drifted right and rubbed my front wheel. I overreacted (I shouldn’t have been crossed wheels anyhow) and went into the ditch. I tried to recover and shoot back out, but instead wrecked. I didn’t go down too hard, but I did slip into the ditch again. I crawled out, put my chain back on, and chased. I lost a minute or two and was now way back. 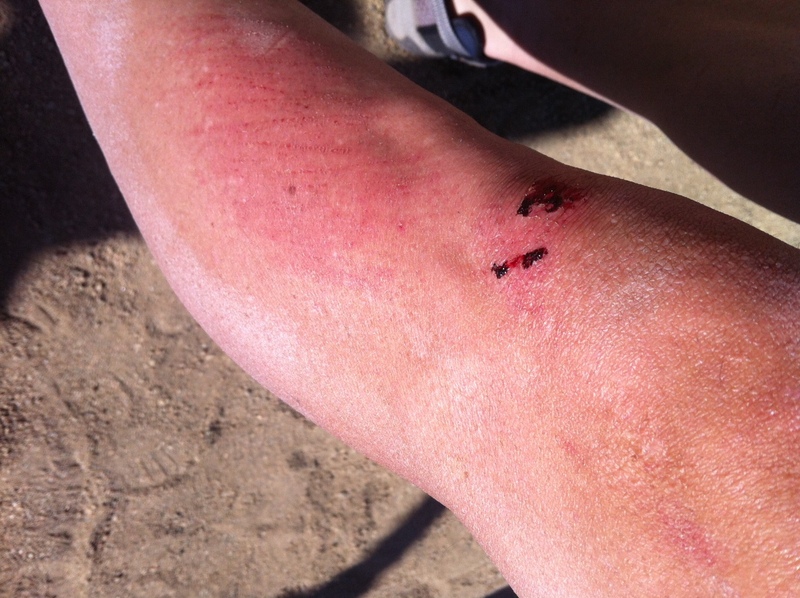 My knee was bleeding and swelling up a bit, but really no damage had been done. My two compadres caught the pack just as they turned onto Nelson and I was full gas chasing. I was pretty upset with myself for this lack of concentration. The wind was picking up considerably then and I began to lose time to the pack. Race was over. However, I hadn’t had any mechanical at this point so I decided I must finish the race. A teammate had passed me as I went down and was about 40 seconds ahead of me, chasing the group. I began to see if I could make it up to him and work together. He was too fast and I ended up chasing him for about 20 miles. Eventually he blew up and I was able to make it up to him. We tried to work together, but poor Ryan had blown sky high. I offered gels and what little water I had left, but he was done for the day. I took a few pulls and he told me to go on since he was so spent. I ended up pushing on a bit to the finish. It was a long tough day. I was disappointed to waste good legs, but I also was pleased with my fitness and the fun course. I had three teammates finish in the front group, just off the winning break. The team is riding great this year. I am excited to see how they do at the Tour of Gila in a few weeks, a big goal for many riders on the team.